Siem Reap Golf Vacation is all about Cambodia golf tour package and it will offer all golf courses in Siem Reap with 18 holes green fee plus compulsory caddies and private single golf cart. These golf clubs will bring you a golf experience in Siem Reap with a smile when you go back home. The Cambodia golf tour package also brings you to many attractive places when you finish the golf each day. Those attractive places are world heritage site of Angkor Wat Temple, other ancient temples in Siem Reap, boat trip to floating village at Kampong Pluk, Artisan D’Angkor Work art, local market, and Silk Farm which covers an area of 8 hectares. DAY 01: Arrival and Angkor Wat Sightseeing. DAY 03: Golf at Angkor Golf Resort and visit Artisan D’Angkor Work Shop. DAY 04: Golf at Phokeethra Country Golf Club and Visit Silk Farm. Upon arriving in Siem Reap, one of our tour guides will welcome you and transfer to hotel for check-in. before departing on a special sightseeing tour of the famous Angkor Wat Temple. Lunch at local restaurant. Spend the afternoon on an extensive tour of the magnificent of 12th century Angkor Wat. The temple complex covers 81 hectares. Your guide will take you through the galleries to show you their stunning bas-reliefs, which depict scenes from the epic Ramayana and the Churning of the Ocean of Milk. End the day watching the sunset over Angkor Wat from the summit of Phnom Bakheng. This evening, enjoy a delicious authentic Khmer dinner at a local restaurant. 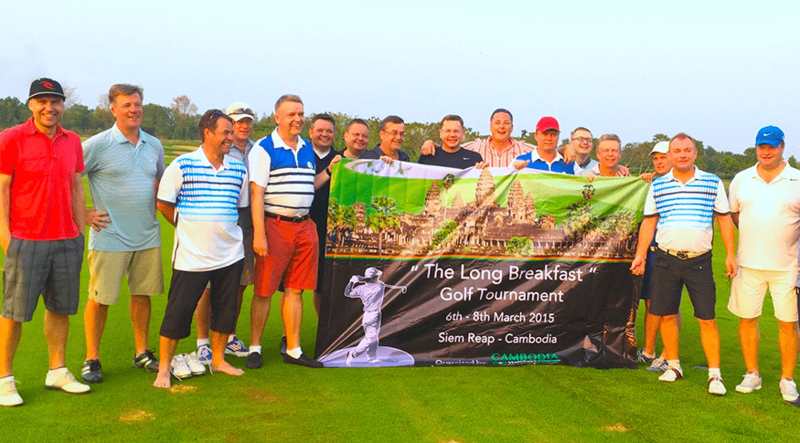 Tee off this morning with a round of golf at the 18-hole Siem Reap Booyoung Country Club. Lunch by your own in the clubhouse after golf. After Golf and Lunch, you will have a boat trip to the floating community of Kompong Phluk, visit an island pagoda, school and houses standing on 7 or 10m high stilts, fish farms and learn about the village life. Then Direct to the largest freshwater lake in South East Asia, Tonle Sap. In this morning, after breakfast in the hotel, you will be transferred to the golf course to enjoy your lunch on the course in the sky view of the clubhouse and starting the first round on the best golf course in Asia as known as Nick Faldo Course “Angkor Golf Resort“. After golf and lunch, we will bring you to the Artisan D’Angkor Work Shop and Local Market for shopping in case you need it. Tee off this morning with a round of golf at the 18-hole Phokeethra Country Golf Club Sofitel Angkor’s luxurious course is world-class and designed for a challenging golf experience. Lunch by your own in the clubhouse after golf. On the way back to the hotel you will have a nice time to visit the Silk Farm which covers an area of 8 hectares, of which 5 are used for the mulberry trees plantation, you will enjoy the beautiful setting while learning about the fascinating process of silk-making. The last day of Cambodia Golf Tour Package is relaxing on hotel until the time to transfer to Airport for departure. Boat Trip to Floating Village at Kompong Pluk. Fresh bottled water and Cold Wipe in the car.